It looks like demand for bike-share in New York is going to be intense. In the first 24 hours of membership sales, more than 4,000 people signed up for annual Citi Bike subscriptions, according to NYC DOT. Comparing the first wave of subscriptions in NYC to other bike-share cities is tough, since the Citi Bike service area is much larger than the other networks, and other cities launched at different times of year. (Capital Bikeshare in Washington, DC, is currently the largest bike-share system in the country, but it launched with only 49 stations.) Even taking into account the relatively large size of the Citi Bike service area, which will provide 6,000 bikes at 330 stations, the sign-up rate in NYC is off the charts so far. Andrea Bernstein at Transportation Nation reports that about 2,000 people signed up for CaBi memberships in the entire month before the system launched in September, 2010. 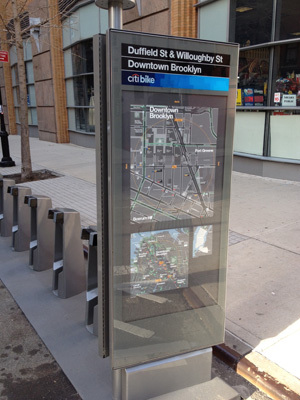 Citi Bike sold twice as many memberships in 24 hours. Total annual CaBi membership now stands at about 32,000, according to this District Department of Transportation tracker. Denver’s B-Cycle, which launched three years ago and is now a 700-bike system, currently has 2,800 annual members in total. Citi Bike exceeded that number yesterday. Hubway launched in Boston in June, 2011, and now has 1,000 bikes at 100 stations. In total, 7,400 people are annual members. At last count, Citi Bike cleared the 4,300 mark by 11:00 a.m. today and was approaching 4,500 by noon. If you were an NYC pol, why would you ever want to mess with all these people who want access to public bikes? Attention everyone running for offices – 4000+ votes in 24 hours were just cast pro-bike. Keep that in mind when you’re begging for votes come election time. It’s amazing how politicians don’t get that. Maybe seeing then on the streets will help. Or maybe once their kids start using it. Don’t get why they won’t release the start date yet. I think it is because they don’t want to be embarrassed by missing it again. They are probably aiming for sometime in the early half of May, but just saying May gives them another couple of weeks if something goes wrong. With all the NIMBYism in NY, it’s a good strategy, IMO. Twitter had someone with a membership ID of 5015. Does that mean we are past 5000 now? I’m sure you’re right, but with such a big launch people want to plan for it. Will it be done by “bike to work day”? Should I buy another month of unlimited metro cards? Would really help people out if they set a date. The real change happens when the politicians themselves start using it. That’s when the bike lanes get well-striped, double-parking gets enforced and greenways and infrastructure actually get funded. With the perverse system of pro-driving perks that exists for politicians at present, I’m not sure we’re quite there yet. Is there even one councilmember that bikes to work? And all this was done on a day in which the news and people’s minds were in many cases very much elsewhere . . . Being that a politicians “job” is to get donations, I’m sure the answer is no. If we changed the system and took money out of it, I’m sure some would. I agree. I bought my annual membership, but would have been much happier if I had known when it starts. I do think it would have still been better if they had given us a start date, but I can fully understand why they didnt (if that is indeed the reason). I heard the annual starts the first time you use it, like an unlimited metrocard, so if out launches when you’re not around you shouldn’t loose time. You have to activate your membership online after you receive your key in the mail. So I’m assuming the one-year clock doesn’t start ticking until then. If you decide you want to let your MetroCard expire before you activate, it seems like you’ll be able to do that. Spread the word, tell everyone about it. A lot of people in NYC do not understand bike share, nor know it’s coming.